There are many hosting companies online, some bigger than others. We’re sure that you know companies like Bluehost and Hostgator, but do you know about A2 Hosting? A2 Hosting is sort of a niche company. They don’t spend much on affiliate marketing like the “big giants” but offer the best hosting services in the market. The hosting company has won many plaudits and awards for the great services they provide. A2 Hosting has been able to find the perfect balance in terms of the packages they offer. The packages can serve almost anybody from a beginner just starting their first website to an expert with more specialized needs. A2 hosting was first founded by Bryan Muthig in the year 2001 under the name Iniquinet. At the time the company served a few local clients and that was what expected at the time. The system was only built to handle a few clients. A2 hosting is one of the fastest growing independent companies in the market (they are not owned by a large corporate holding company like Bluehost or Endurance). In recent times, the company has also placed focus on being environmentally friendly by lowering their carbon footprint. To achieve this, they partnered with carbonfund.org. Carbonfund is a company that aims at reducing the effects of climate change worldwide via best-accepted practices. Now that you have an overview of who A2 hosting is, we can have a look at the features that the company has to offer. For those that might not know, SSD stands for Solid State Disks. They are an upgrade from the previous traditional hard disks. The difference between the two is SSDs use non-volatile memory to store information while traditional hard disks use regular volatile memory. This gives SSDs an advantage as data isn’t lost when there is power loss. One of the main features that A2 hosting offers is SSD hosting. In fact, they were one of the first hosting companies to offer this feature and are one of the few that offer SSD hosting across the board. The benefit of SSD hosting is that access times are lower compared to hosting on traditional disks. Access time is the time it takes to locate the data area on the disk before it can be read from or written to. This means your website can load faster which bodes well for SEO and better user experience. Turbo hosting is a specialized offering from A2 Hosting. This feature is supposed to make your website up to 20 times faster. Turbo hosting is not offered for all the plans, but it’s a great option to have if you can afford it. With this option, you get pre-configured caching options as well as a custom turbo product that improves your website load times. For those more tech-savvy, you also get the PHP API and APC is enabled as well. APC stands for Alternative PHP Cache. It’s a PHP accelerator and framework that boosts the performance and speed of PHP on busy websites and does the same with PHP software applications as well. A2 Hosting is a company aimed at serving the global market. They live up to this by offering multiple data centers for their users to choose from. There are many factors that determine the speed of your site and the location of your server is definitely one of them. It’s always better to have your site hosted on a server close to your local audience. Many hosting companies cater only to the US market (their servers are located only in North America). This would be a problem for those in other areas like Europe or Asia. A2 hosting has 3 data centers for you to choose from; The US, Europe, and Asia. This is a hack scanning protection software developed by the team at A2 Hosting. It comes free with every hosting and runs 24 hours a day, 7 days a week. It works to block attacks before they damage your site. It also includes custom malware signatures that the company updates regularly. A2 hosting partnered with Patchman to make your site even more secure. The Patchman software is there to complement Hackscan. It provides application patching, quarantining infected files and detecting outdated versions of web applications that you might be using. As part of the perpetual security initiative, you also get this software extension installed into your Linux servers. It enhances the security of your Linux kernel and gives you daily, automatic, reboot-less kernel updates. This feature is loved and noticed by many. Websites easily break and there is no avoiding that. This is why you’re advised to take backups of your website as often as you can. There are people who forget to do this and it doesn’t end well for them. With A2 hosting, they offer server rewind, a system that backups your database and site files regularly. It also allows you to access this data and restore it to your site at any point/time with no limitations. RAID stands for Redundant Array of Independent Disks. RAID 10 is a data loss prevention feature A2 hosting uses to keep data on their servers safe. RAID 10 as a storage configuration stores all your data in multiple drives. What this ensures is when one hard disk dies or gets corrupted, the data isn’t lost instead it’s stored on another hard drive. The configuration allows for the dead/corrupted hard drive to be replaced with little to no issues at all. This adds to the reliability factor of the hosting company as it’s almost impossible for them to lose your data. A2 hosting also has some other great features. We chose not to list them separately as they’re not unique to any single company. For instance, cloud hosting. A2 hosting offers cloud solutions for businesses and individuals that don’t want their data on physical servers. This hosting solution provides you with more security as well as more control over your data. With cloud hosting, your site will always load fast and have good uptime. On top of that, the hosting company also offers 1 click installs for most of the well known CMS like Joomla and WordPress. You also get to access support anytime you want via 3 methods; Phone call, live support, and chat. A2 Hosting is providing exclusive discount deals on all their hosting plans for MaherHackers users. Sign up using our discount link given below and receive exclusive A2Hosting discount. Like any other hosting company, A2 offers different packages for you to choose from. The packages are made to meet different needs as well as different expertise levels. Let’s have a look at what they have to offer. Before we begin, you need to know that A2 hosting gives all its users options on the Operating System (OS) that they can have running on their servers. You’ll notice once you visit the packages page that there is the Linux and Windows Option. Both have different prices with the Windows plan being more expensive. Unless you’re a system administrator or looking to set up a VPS or Dedicated server, then you probably don’t and shouldn’t care much about this. Hosting packages using the Linux servers tend to be cheaper compared to those using the Windows server. You can even see this when going through the different packages offered by A2 Hosting. The first difference is the operating system. Servers like PCs require an operating system to function properly. With servers, you have Linux and Windows. Linux servers run on the Linux OS while Window servers run on the Windows OS. Linux OS has always offered more customization than Windows OS and that’s no different here. If you’re a developer or are just simply looking for more customization options, then we’d advise you to use Linux servers instead of windows servers. In terms of configuration and setup, the Windows OS takes the top spot here. There isn’t much to do and it’s easy to workaround the .NET framework. Linux servers are more stable and secure owing to their open source nature. This is not to say that Windows servers are easy to hack or unstable, no not at all! It’s just that the servers running Windows aren’t at the same level as the Linux servers as far as stability and security are concerned. Just as a quick note, many hosting providers tend to use Linux servers. This is because it can host the cPanel application, offers more customization and is cheaper. We have always used Linux server ourselves and recommend everyone to use it as well. When it comes to web hosting server, Linux hosting takes the win! This is the entry-level plan. With this plan, you’re only able to host 1 website. With that, you get 5 databases, unlimited storage, unlimited transfer, a free SSL certificate, unlimited SSD disk space, and unlimited transfers. Here we have the mid-range option. It’s one of the more popular options in the shared hosting plan. This package provides you with the ability to host unlimited websites. On top of that, you get unlimited databases, unlimited storages, unlimited transfers, a free SSL certificate, and unlimited SSD disk storage space. The difference between this plan and the Lite plan is in the number of websites you can host. 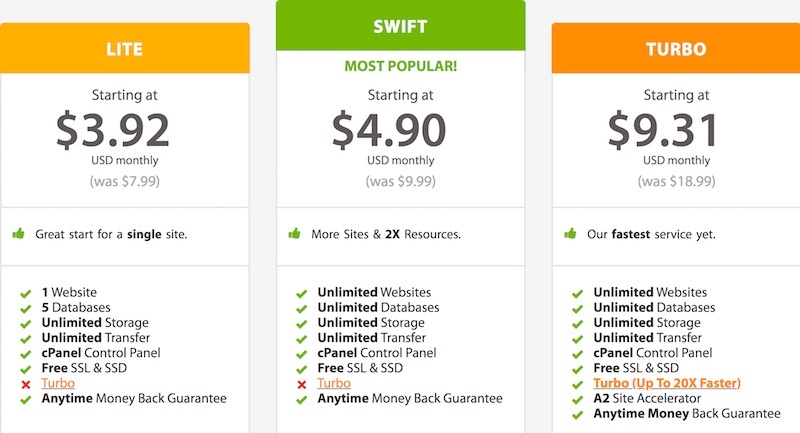 The Swift plan gives you more resources to host more websites. The final plan in the shared hosting category. It’s the high-end plan and it offers extras to help improve the speed/performance of your website. With this plan, you get the turbo option that A2 claims can make your website up to 20x faster. This is because your website is placed in the company’s Turbo servers. Turbo Cache: This option caches the entire contents of your HTML pages. This allows them to load without having to use PHP. OPCache/APC: This is a framework that boosts the performance of your website by improving the response time of pages that require the use of PHP. Memcache: It works by increasing the speed of the MySQL database. It places important data in memory making it easier to retrieve the data when needed. This is the next tier of their hosting plan and is designed for users who have outgrown their shared hosting plans. If you need more speed or control of your server, then this is the plan for you. Unlike the shared hosting plan, some technical expertise is required to use the VPS hosting plan. You might need to hire a system administrator if you’re not tech savvy. But If you subscribe to Manages VPS, it’s not the case as A2 Hosting manages it for you and provide full support. Like in the shared hosting plan, A2 hosting gives you the choice of using a Linux server or a Windows server. The Windows server is of course slightly more expensive than its Linux counterpart. This hosting plan is for users that are tech savvy and know how to manage a server. Developers and system administrators are best served with this plan. You get root access of the server and the power to apply many customization options. This plan is unique and not many hosting companies provide it. It’s meant for the everyday user that doesn’t know much about server management. The way the plan works is the A2 team becomes your system administrator of sorts. The team deals with the server management part of the package. You get all the features of a VPS bundled with a user-friendly cPanel platform making it easier to use. The A2 team are part of the package and are available 24/7 to help you if ever were there any issues to arise with the server. This package is right in between the Managed and Unmanaged VPS in terms of features. With this package, you get the user-friendly Cpanel and 24-hour support team from A2 like in the Managed Plan. You also get root access to your server like in the Unmanaged package. It’s like the best of both worlds, you get to have full control of your server and a dedicated support team. This option is made for users that want more power, but aren’t ready to own a server. It’s way cheaper compared to the other options on offer. Semi Dedicated Hosting offers a good compromise as you get better isolation and more power at an affordable cost. An option suited for developers and system administrators. This plan allows you to own and manage your own server. The Managed dedicated server option is like the managed VPS solution except with the former option you own an entire server. In this option, you get the A2 support team available all the time to help you when issues arise. This plan gives you all the advantages that you’d get with the Managed Flex server as well as root access. You have control of your server and a dedicated support staff to help you in case you encounter any problem. With A2 hosting, you get stable and proper uptimes. We don’t need to tell you how important uptime is. It can be the difference between your site success and failure. 100% Uptime is almost impossible in fact, don’t trust a hosting company that claims to offer that. The industry standard is at 99.72%. One thing’s for sure, numbers don’t lie. Our stats for uptime while using A2 hosting were amazing. Our site had an uptime of up to 99%, which is good when compared to other hosting companies. The same can be said about load times. It’s crucial for any website to load within 6 seconds any more and your site is bound to fail. A2 hosting claimed to offer 20X faster than competitors, especially with the turbo plan. We tested their load times over a period of time to see how well they performed. The results came back and it was good. The sites loaded quickly every time over the course of the test. The consistency is what we loved most. The load times were almost the same every time we run the test. You can access their extensive knowledge base to get simple problems solved before contacting support. A2 hosting says that support is available 24/7/365 and they live up to that. Call support at any time and you shall be answered. If you’re prompted to leave a message, don’t worry! They’ll call you back. The company has worked at adding a personal touch to their service and that’s good. Unexpected issues generally arise with hosting and support should be immediate or you stand to lose visitors or worse money. As said earlier, the location of your server does matter when it comes to fast load times. If you want your audience to get fast load times, then it’s always advised to have your server located near them. A2 hosting has this covered as they have data centers located in Europe, US, and Asia. This is impressive as many of the other big hosting companies like Bluehost tend to have servers located in the US. If you’re serving a global market or an audience in countries other than the US, then A2 Hosting is for you. You have to give credit to the company for they have provided their users with plenty of options with every package. These options are clearer the higher up the package is. For example, with VPS Hosting, you not only get managed and unmanaged VPS hosting. You also get core VPS hosting; a combination of the two options previously mentioned. A2 hosting has tried to make sure that their plans are made to suit many types of people. You’ll probably find the package suited for you with A2 Hosting. SSDs are way better than the traditional hard disks. It contains less moving parts and can read and write quicker than its traditional counterparts. SSDs in your hosting plan can definitely improve your site’s load times. This is because data can be drawn from it quicker when compared to the older version of hard disks. A2 Hosting offers free SSDs with every plan you purchase from them. It’s no surprise that many people who use them have stated an improvement in site speed. This might not be a selling point for many, but it’s good to know that there are companies that care for the environment. A2 hosting partnered with Carbonfund to find ways in which they can reduce their CO2 emissions. The hosting company currently purchases carbon offsets for every amount of energy they use. These carbon offsets are used to fund environment-friendly projects, like planting trees or upgrading power plants to make less pollution, around the world. In addition, the company also recycles old hardware/servers instead of throwing them out. A2 Hosting trusts their products and what they offer. For every purchase of their hosting plan, you get a money back guarantee. You’ll get a full refund if you weren’t satisfied with the service you received. Of course, this offer is available to claim within 30 days after which it’s no longer available. You should also note money used for the purchase of SSL certificates and domain registrations are not refundable. We have used many web hosts and we can tell you now that some of them charge big bucks to transfer your site to their hosting platform. A2 Hosting is different, they charge nothing to transfer your site to their hosting. It’s completely free! The only condition is the site should have been hosted on an account that uses Cpanel. It’s definitely a privilege worth thinking about as it can be quite the hassle to transfer your site manually. A2 hosting has made security a priority for all sites on their hosting plans. They don’t wait for you to use the tools. The tools are active at all times. Some of the solutions are including KernelCare, Patchman, and HackScan. All these tools work together seamlessly to make sure that your site is up to date and well protected from Malware and hackers. This is a fact, A2 hosting is more expensive than many of the other hosting companies. They do offer discounts for the first time users, but even their discounts are more expensive compared to the average. With that said, you need to remember the adage “You get what you pay for”. You might be paying more, but the services you get will be amazing. A2 hosting doesn’t offer much in terms of free credit and promotions as compared to other companies in the market. This might be a disadvantage for those that look to take advantage of promotions and discounts offered to regular users of a hosting service. So that concludes our A2 Hosting Review. You now know about A2 hosting and what they have to offer. We believe the hosting company has amazing packages on offer and an even greater support system to supplement it. The prices offered for the packages might be higher than the average, but you can be sure of great uptime and load speeds. We’d advise you to give A2 hosting a try, you won’t regret it.